Africa’s resources include an abundant supply of petroleum, natural gas, and wood for fuel. The continent also has numerous rivers and waterfalls that could provide hydroelectric power. But Africans rely mostly on wood for energy. Most of the continent’s other resources are expensive, available only in small quantities, and in limited areas. For a number of reasons, the development of petroleum, natural gas, and hydroelectric resources has proceeded slowly in Africa. Distributing the energy to consumers presents another problem. In addition, foreign ownership of energy resources has drawn off much of the continent’s oil and gas for sale abroad. Africa contains about 7 percent of the world’s known reserves of petroleum, 6 percent of its natural gas, and 6 percent of its coal. These resources are not evenly distributed throughout the continent. The North African countries of LIBYA and ALGERIA have about two-thirds of the petroleum. NIGERIA and ANGOLA account for almost all the rest, along with CAMEROON, CONGO (BRAZZAVILLE), GABON, and CONGO (KINSHASA). The situation is much the same for natural gas because natural gas and petroleum often occur in the same location. Coal, another important fuel, is found mainly in SOUTH AFRICA. 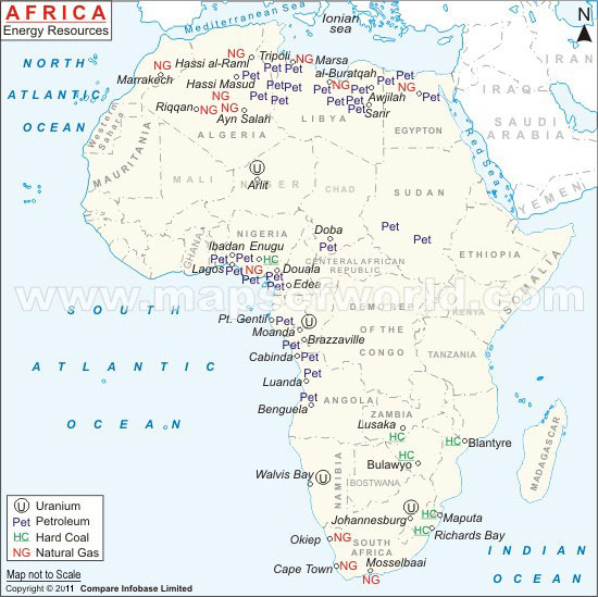 The potential for hydroelectric power is concentrated in two main areas in Africa. The first is the string of great lakes running though East Africa from KENYA in the north to ZAMBIA in the south. The other is the West African coastal region from GUINEA to Angola. Between these two regions, Congo (Kinshasa) contains some 60 percent of Africa’s hydroelectric resources. However, only half of this potential energy can be tapped with existing technology. The main energy source in Africa is fuelwood. Nearly a quarter of the land in sub-Saharan Africa is covered by forest. Some countries, such as SWAZILAND, are thickly forested, while others such as MALAWI have almost no wooded areas. The heavy use of fuelwood has raised a serious concern about deforestation. Over 25 million acres of tropical forest are cleared each year in Africa, mainly for agriculture and human settlement. In some areas, the problem is severe. For example, virtually all the land within 250 miles of Sudan’s capital KHARTOUM has been cleared of wood. African countries face a number of difficulties in producing and delivering energy to their people. Among the most serious is the lack of infrastructure. Most countries lack the money to explore for petroleum or to put in place the equipment and facilities required for obtaining, refining, and storing petroleum. The facilities that do exist are often outdated, too small, and in need of repair. In addition, the poor state of transportation in Africa makes it difficult to distribute oil efficiently or profitably. Because many electric power plants run on petroleum, the problems with Africa’s oil industry affect the production of electricity. Hydroelectric facilities are less dependent on petroleum but cost a great deal of money to build. They have other drawbacks—such as altering the local environment, sometimes forcing people to relocate, and producing much less power during droughts. The lack of infrastructure also hampers the distribution of electricity. Networks of electrical wiring are very limited, and few of these power grids are connected between countries. This makes it difficult to share or trade power over national borders. In addition, outdated equipment and the high cost of maintenance make the power supply rather unreliable. As a result, many wealthy households, companies, and factories invest in their own power generators. The vast majority of Africans rely on wood as their primary source of energy. The problems with commercial fuel—petroleum, natural gas, or electricity—make it very expensive and difficult to get. Wood provides about 85 percent of all the energy used in Africa. Even in most cities, wood accounts for almost half of the energy. However, the use of fuelwood is difficult to measure or regulate in the same way as other fuels because many people gather it themselves and do not pay for it. Most of the commercial fuel consumed in Africa goes to industry. However, Africa’s industries are not highly developed, and this is both a result and a cause of the continent’s difficulties with energy production. The uncertainty and cost of commercial energy has hindered industrial growth. At the same time, the low demand from industry gives energy producers little reason to expand or modernize their facilities. Most of the commercial energy not used by industry goes to transportation, mainly passenger cars. A small percentage of Africa’s energy comes from so-called alternative fuels. These fuels include solar energy (from the sun), thermal energy (from the earth), and biomass energy (from plant matter or animal waste). Africa’s geography and climate make it an ideal place for solar energy, but alternative fuels in general have not been popular. The high cost of equipment and lack of knowledge have resulted in little interest in alternative technologies. Some countries have offered tax breaks to encourage industries to use alternative energy sources, but these efforts have found only limited success. Although poverty and lack of infrastructure are serious obstacles to the growth of Africa’s energy industry, politics has also played a role. War and civil unrest undoubtedly take a toll on production and distribution, and energy policies can be almost as destructive. In the early 1990s, the Nigerian government, which owns the country’s oil industry, adopted a policy of selling oil to its citizens below market value. This led to widespread smuggling of oil across Nigeria’s borders by private citizens, causing producers to lose profits. The smuggling problem got worse and eventually contributed to an oil shortage in Nigeria, even though that country is a major producer of petroleum. However, national governments are not in full control of their countries’ energy supplies and policies. As in the colonial era, much of Africa’s oil reserves and production facilities are owned by corporations based in North America and Europe. Also, loans for major energy projects such as dams often come from international agencies such as the World Bank and International Monetary Fund. In many cases, these loans come with strict instructions on managing energy industries. To repay these loans, African nations must produce energy and other resources for export sales. Thus much of the profit from African oil leaves the continent. African energy policy is not always designed to meet the needs of the people.